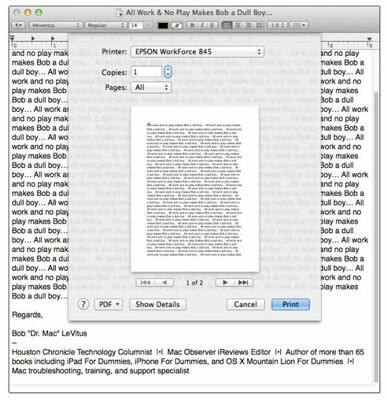 Navigating the Print sheet in OS X Mavericks is the last thing standing between you and your output. If everything has gone well so far, the actual act of printing a document is pretty simple. Just follow the steps here, and in a few minutes, pages should start popping out of your printer like magic. Open a document that you want to print. Choose File→Print (or press Command+P). You see the basic Print sheet. Just as you can in the Page Setup sheet, you can choose which printer you want to use from the Printer pop-up menu of the Print sheet. By default, the Print sheet is displayed with its details hidden. As such, just three menus are available: Printer, Pages, and PDF. To reveal the rest of the Print options, click the Show Details button near the bottom of the Print sheet. An expanded Print sheet with all the details you’re likely to need, replaces the more streamlined version. Copies: In this text field, set how many copies you want to print. The Print sheet defaults to one copy (1) in most applications, so you probably see the numeral 1 in the Copies field when the Print sheet appears. Assuming that’s the case, don’t do anything if you want to print only one copy. If you want to print more than one copy of your document, highlight the 1 that appears in the Copies field and replace it, typing the number of copies you want. Pages: Here, you find two radio buttons: All and From. The default behavior is to print your entire document, so the All option is preselected. But if you want to print only a specific page or range of pages, select the From radio button and type the desired page numbers in the From and To text fields. 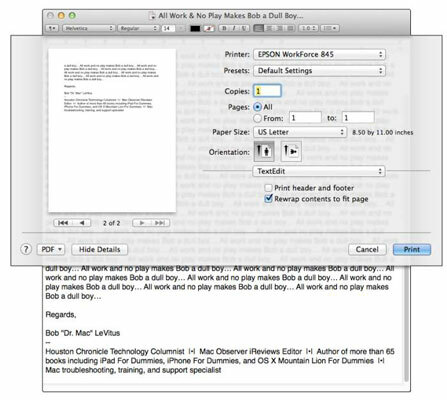 Paper Size: Use options in this pop-up menu to choose the type of paper currently in your printer’s paper tray — or to choose the size of the paper that you want to feed manually. The dimensions of the paper appear below its name. Orientation: Once again, you’ve seen this setting in Page Setup. And once again, the choice you make in Page Setup is the default for all pages you print. Keep in mind that the setting you choose here (in the Print sheet) applies only to this document. Choose among options here to tell your printer whether the page you want to print should be portrait or landscape oriented. TextEdit: The only TextEdit-specific options are two check boxes. One governs whether to print a header and footer for this document; the other lets you choose to rewrap the contents of the document to fit the page. You can see the results of clicking these check boxes in the proxy image of your document on the left half of the sheet. Pages per Sheet: Choose preset numbers from this pop-up menu to set the number of pages that you want to print on each sheet. Layout Direction: Choose one of the four buttons that govern the way pages are laid out on the printed page. Border: Your choices from this pop-up menu are None, Single Hairline, Single Thin Line, Double Hairline, and Double Thin Line. Two-Sided: If your printer supports two-sided (known as duplex) printing, the three radio buttons allow you to specify whether you’re going to use two-sided printing and, if so, whether you’ll be binding (or stapling) along the long or short edge of the paper. Two check boxes — Reverse Page Orientation and Flip Horizontally — do just what they say if you enable them. Color Matching: Choose Color Matching to choose a color-conversion method. The idea here is to get the printed page to look as much like what’s on your screen as possible. Paper Handling: Choose Paper Handling if you want to reverse the order in which your pages print or to print only the odd- or even-numbered pages. You can also specify whether the document’s paper size is to be used or whether the output should be scaled to fit the chosen paper size. Cover Page: Choose Cover Page to add a cover page. Print Settings: Choose Print Settings to choose paper type and print quality. After you finalize printer settings, you can save them for future use. Just click the Presets pop-up menu and choose Save Current Settings as Preset, and provide a name for this preset. From then on, the preset name appears as an option in the Presets pop-up menu. To manage your custom settings, known in Mavericks-speak as presets, choose Show Presets from the Print sheet’s Presets pop-up menu. This nifty feature displays a list of your presets and their settings and allows you to delete, duplicate, or rename (by double-clicking their current name) your presets.